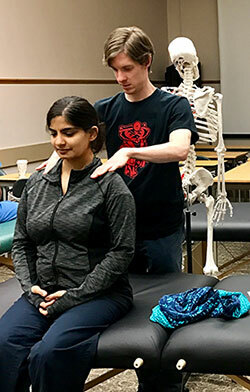 A new elective launched this year in the Department of Family Medicine and Community Health’s (DFMCH) Madison residency program offers allopathic residents, fellows and faculty an opportunity to learn basic skills in osteopathic manipulative treatment (OMT). Osteopathic medicine seeks to treat the whole person while promoting the body’s innate ability for self-healing. It’s rooted in the concept that the body’s physical structure—the relationship between nerves, muscles, bones and organs—affects physiologic function. OMT seeks to correct those structural problems though a variety of modalities, including soft tissue, counterstrain, muscle energy and myofascial release. Developed by DFMCH faculty Sarah James, DO, and osteopathic chief resident Jared Dubey, DO, the course, “Osteopathic Manipulative Treatment for the Allopathic Physician (OMT4MD),” consists of required readings, online lectures and nine monthly hands-on labs. Each lab focuses on a different area of the body, such as the lumbar spine, lower extremities, pelvis, sacrum, thoracic spine, ribs, cervical spine and upper extremities. Through the course, participants learn to formulate osteopathic treatment plans for common conditions, perform osteopathic structural examinations and gain proficiency in OMT modalities. They’re also encouraged to shadow an osteopathic physician in the clinic, which provides the learner with hands-on mentoring and a supportive learning environment. Above, Tom Hahn, MD, practices an OMT technique with Suhani Bora, MD. “This course gives MDs awareness and comfort in knowing that it’s OK to put your hands on a patient and try some new techniques that are going to be helpful to patients,” notes Allison Couture, DO, a Madison resident who, along with alumna and current palliative medicine fellow Jasmine Hudnall, DO, helps teach the course. OMT is indicated in many primary-care clinical scenarios. It can be used to alleviate pain, restore motion, and help the body function more efficiently. Studies have also shown that the use of OMT significantly decreases the use of oral pain medicines in patients with low back pain and shortens hospital stays for patients with pneumonia. Learners who complete the elective and demonstrate competence will receive a certificate of completion indicating proficiency in OMT. “I use OMT on an almost daily basis in clinic, and I regularly have patients asking me after a successful treatment, ‘This works so well; why don’t all doctors get taught to do this?’” Dr. Dubey notes. The first OMT4MD course will end on June 7, 2017. The Madison residency program is planning to offer it again in the 2017-2018 academic year. For more information about the course, or for questions about enrollment, contact OMT4MD@fammed.wisc.edu or visit https://inside.fammed.wisc.edu/residency/madison/omt4md.